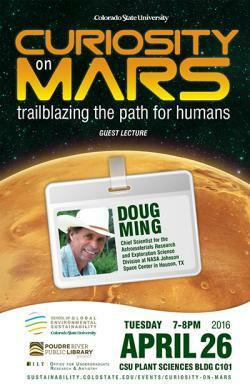 April 25, 2016 – On Tuesday, April 26, join Dr. Doug Ming, Chief Scientist for the Astromaterials Research and Exploration Science Division at NASA Johnson Space Center for a talk about the Mars Science Laboratory rover Curiosity. The free public lecture will be held at Colorado State University in Fort Collins, Colorado. Curiosity has successfully explored Gale crater on Mars for over 3 Earth years. The data being acquired by Curiosity will help NASA mission planners answer critical questions about Mars including what the radiation environment is like, whether or not martian dust will be toxic to humans or corrosive to spacecraft parts, and whether or not humans can built habitat structures on the surface of the planet. Curiosity is “blazing a trail” for human exploration on Mars by answering these important questions. Dr. Ming has participated on the science teams for several Mars robotic missions, including the Mars Polar Lander, Mars Exploration Rovers Spirit and Opportunity, Mars Phoenix Scout, and Mars Science Laboratory Curiosity missions. He led tactical science operations for Phoenix and he currently leads tactical science operations for Curiosity. He will share some of his insights from the programs. The event will be held from 7:00 p.m. to 8:00 p.m. MDT in CSU Plant Sciences Bldg C101. For more information, contact Kristin Pintauro via email: Kristin.pintauro@colostate.edu or phone: (970) 492-4215.